Here is the text of the proposed city of Orlando marijuana ordinance. It appears that Orlando will be joining Tampa and St. Petersburg in the drive to decriminalize marijuana in Florida. The Orlando marijuana law makes a third offense have a mandatory court appearance. court appearance for the third and subsequent offenses. " 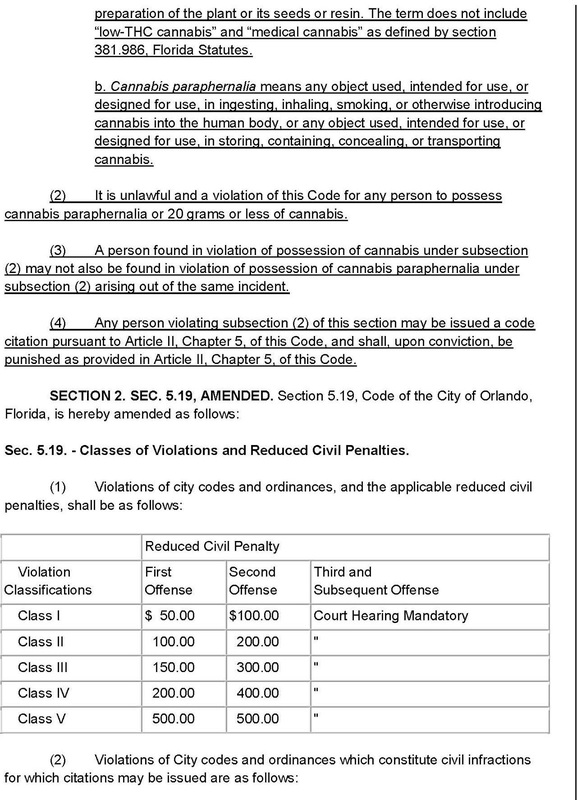 AN ORDINANCE OF THE CITY COUNCIL OF THE CITY OF ORLANDO, FLORIDA, RELATING TO THE POSSESSION OF CANNABIS AND CANNABIS PARAPHERNALIA; CREATING SECTION 43.95, ORLANDO CITY CODE, MAKING POSSESSION OF 20 GRAMS OR LESS OF CANNABIS A CITY CODE VIOLATION; FURTHER MAKING POSSESSION OF CERTAIN DRUG PARAPHERNALIA A CITY CODE VIOLATION; PROVIDING FOR CIVIL PENALTIES; PROVIDING LEGISLATIVE FINDINGS, AND FOR SEVERABILITY, CODIFICATION, CORRECTION OF SCRIVENER'S ERRORS, AND AN EFFECTIVE DATE. Sec. 43.95. - Possession of cannabis or cannabis paraphernalia. a. Cannabis means all parts of any plant of the genus Cannabis, whether growing or not; the seeds thereof; the resin extracted from any part of the plant; and every compound, manufacture, salt, derivative, mixture, or preparation of the plant or its seeds or resin. The term does not include "Iow-THC cannabis" and "medical cannabis" as defined by section 381.986. Florida Statutes. b. Cannabis paraphernalia means any object used. intended for use. or designed for use. in ingesting. inhaling. smoking. or otherwise introducing cannabis into the human body. or any object used. intended for use. or designed for use. in storing. containing. concealing. or transporting cannabis. (2) It is unlawful and a violation of this Code for any person to possess cannabis paraphernalia or 20 grams or less of cannabis. (3) A person found in violation of possession of cannabis under subsection (2) may not also be found in violation of possession of cannabis paraphernalia under subsection (2) arising out of the same incident. (4) Any person violating subsection (2) of this section may be issued a code citation pursuant to Article II. Chapter 5. of this Code. and shall. upon conviction. be punished as provided in Article II. Chapter 5. of this Code. Sec. 5.19. -Classes of Violations and Reduced Civil Penalties. According to the City Council Agenda, "Proposed ordinance #2016-36, relating to the possession of cannabis and cannabis paraphernalia. . . . Proposed ordinance #2016-36 would make possession of 20 grams or less of marijuana or possession of cannabis paraphernalia a city code violation. Violations are a civil infraction, rather than a crime, and are punishable by a $50 fine for the first offense, a $100 fine for the second offense, and a mandatory court appearance for the third and subsequent offenses. Under current state law, possession of 20 grams or less of marijuana (or marijuana paraphernalia) is a first degree misdemeanor punishable by up to 1 year in jail, up to a $1,000 fine, up to 1 year of probation, and a possibly life-long criminal record."